Birmingham offers thousands of beautiful homes throughout the metropolitan area and surrounding communities that give access to great shopping, wonderful restaurants, baseball, theatre, museums, and southern hospitality at its finest. 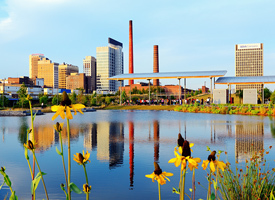 These are just a few of the great amenities that Birmingham has to offer. So whether you are looking for a new home in Gardendale, Helena or Greystone let an experienced company assist you in locating your next home or investment property or selling your current home. AHI Properties offers a full array of real estate services and understand the complexity of today's market. Contact us today and put our experience to work for you and let us be the first to say "Welcome to Birmingham".